People are in an endless journey to look for better ways to restore their health, live a long life, and recover fast from illnesses. Along the way, we find islands of information that can serve as our guide toward the right path toward health restoration. Then, we separate ways from our different views on wellness, different lifestyles we choose, different diets we opt to observe. At the end of the day, after searching and searching for perfect ways in state of balance, we are still lost. Nevertheless, there is always another day to begin with clean state. With this regard, let us present to you the theories behind the best selling book of Dr. Robert Young, PhD, and Shelley Redford Young, titled The pH Miracle: Balance Your Diet, Reclaim your Health. There are some points in this article that are backed up with other theories with no intention to contrast the idea but to give more objectivity to some health claims presented that others may find unusual. The chapter begins on the importance of balance and the causes of imbalance to health which normally occurs in many signs of diseases: fatigue, excess weight, poor digestion, foggy thinking, body aches, and major diseases. It depicts the essential information on how to reclaim health balance for it is our birthright to live a longer and healthy life. The idea is that all the major diseases like cancer, diabetes and cardiovascular diseases are linked to poor diet and only by eating the proper foods with best nutrients; we can restore our body chemistry in balance. To top it off, the pH level of blood and tissues is the single measurement important to health because the alkalinity and acidity greatly affects every cell that regulates our body. 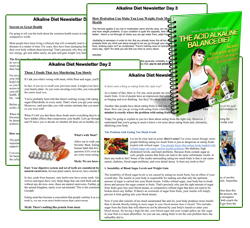 The goal of the program allows every reader to maintain the proper alkalinity of the body. 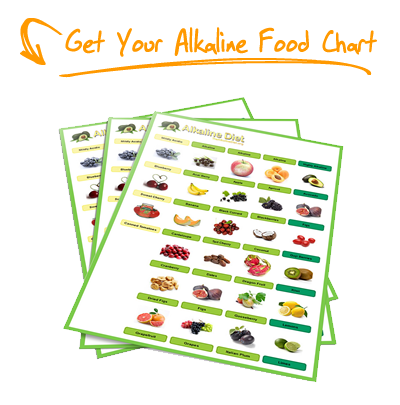 The 80 percent alkalizing foods and only 20 percent or small portions of acid forming foods is most recommended. The book reveals promising information that may increase the quality as well as the quantity of life. Well stated how “good health should be the second nature to us”. In this chapter, it tackles the important premises to maintain the chemistry balance of the body. The A stands for acidic, the main door for sickness. There is one common reason for this: an acidic body is susceptible to diseases. From scale 1 to 14, the body has to maintain the scale of 7.365 as neutral for acid base chemicals; these are opposite to each other. Understanding the two concepts can make it easier for you to understand the basics on how to regain the total health balance. The B stands for the blood. If the pH level deviates far to the acidic side, the oxygen levels may decrease and the cellular metabolism will definitely stop resulting to dysfunctional thyroid glands and weakened organs and body systems. Now, our blood plays the important role in pulling alkaline minerals from our tissues in order to compensate the declined pH. Alkaline minerals such as magnesium, calcium, sodium, and potassium act as neutralizers and create less detrimental substances eliminated by the body. If these minerals decrease and acid build up stored in the body system, this is where various symptoms of diseases occur. Lastly, the C stands for Latin name Candida which means fungus or yeast commonly found in the gastrointestinal tract of human and if drastically overgrown, it may cause variety of symptoms from chronic to fatal. Actually, the typical Western diet rich in fats, proteins and carbohydrates can produce microforms and acidic wastes upon digestion and they love to thrive in acidic environment. But of course, it can still be reversed from acid environment and return back to base so that fungus may stop growing and be eliminated from our body. One good example given is when the fish are sick, and then the best option is to change the water. The fish tank is compared to our body composed of cells and organs that are bathed in fluids such as blood in which transport food and eliminate acid wastes. The best way to get rid of the polluted tank is to change the water environment through alkalizing the body. In this chapter, the focus is on good digestion for sustaining good health. The symptoms of indigestion cause digestive disturbance that supports microform overgrowth and promotes an acidic bloodstream. There are three key parts of digestion that have to be in good working condition- begins in the mouth, continuing in the stomach, and then into the small intestine. But there are always problems in every step. Starting from indigestion then reduced absorption of nutrients in the small intestine, and lower bowel constipation on the last process. With all these common troubles, the healthy bacteria or probiotics can help to prevent the overgrowth of microforms and neutralize the toxins. The worst implication of microforms overgrowth is not only that it can go along with bloodstreams but it can also go deeper into organs and tissues, skeletal structure, lymphatic system, bone marrow, and central nervous system. At last, the presentation of ideas behind this chapter is to eliminate mycotoxins through alkalizing the body in proper diet. The process of how every food digested can either form acid or alkaline residue. In general, acidic foods are all animal foods, dairy products, yeast and fermented foods, processed foods, artificial sweetener, alcoholic drinks and sodas, and even some fruits. On the other hand, vegetables are on the top list of great alkalizing food including some technically fruits such as tomato, avocado and bell pepper. Of course, the always misinterpreted citrus fruits like lemon, sprouted seeds, nuts and some types of grains including spelt, buckwheat, and millet. The rule of the thumb of eating raw foods is better in alkalizing more than cooked foods. Heat more than 118 degrees can destroy the important enzymes that our body needed. To sum it up, here is some of the authors’ claim on how to reclaim ones health. First and foremost, sugar primarily feeds microform. Those foods containing sugar like syrups, candies, soft drinks, ice cream, pastries, and “natural” sugars from fruits should be avoided. The concept always depends on the food we eat and the level of acidity in the stomach. The program says that the low-sugar and high water content foods cause less stomach acidity and vice versa. It is understandable to avoid junk foods and others that are harmful to health, but why fruits? This may sound contestable to many as fruits contain good vitamins and minerals, not to mention the rich in fiber content. Nevertheless, the program presented how much sugar we get from some variety of fruits. For example in pineapples, there are 28 % sugar content; bananas have 28%; honeydew has 25%; mangoes consist of 18%; apples have 15%; oranges and cherries have 12%; strawberries have 11%; and watermelon consist of 9%; Meaning to say, regardless of its nutrition, sugar is still sugar and microforms dwell on it and create acidic environment. However, the only exceptions are lemons, limes, grapefruit and non sweet fruits. But small portion of fresh and seasonal fruits eaten occasionally is fair for a treat. It is also worth taking a note that fruits should be eaten alone and as separate meal. The theory supports that fruits are digested in faster rate and require different enzymes than any other foods and when consumed with other foods such as protein and carbohydrates, the tendency is to cause delayed digestion and fermentation. In connection with the last statement, food combining is also an important consideration because the digestive system is not made for complex meals. Therefore, different foods make specific demands in digestion process. Just remember that for protein foods, it require highly acidic environment and digestion takes place in the stomach, while carbohydrates require alkaline environment and digestion begins in the mouth the continues in the small intestine. Same thing goes with the combination of sugar and starch, and sugar and protein. Combination of protein and starch is abusing to our digestive systems. Other interesting concept of this program is the combination of food and drink, especially cold drinks that can shut down digestive activity. Drinking while eating can dilute digestive chemicals so the best way to drink water or beverages is at least thirty minutes before and after a meal. There is only one exemption to the rule: vegetarian can drink while eating. Another rule for food combining: eats first the juicer food like vegetables or salads, and then followed by heavier and solid foods. The book is proponents of vegetarian diet. If some people are worried where to get enough protein from meat, worry no more because various green vegetables also contain protein. Likewise, the program recommends eating fish at least twice a month. Replacement for meat protein can be legumes, raw nuts, avocados, and grains which consist of high-quality protein and best assimilated than meat products. The no fat obsession of many dieters become a pitfall for wrong diet and crucial to health including foods high in trans fats and some of its misnomer such as polyunsaturated fats, partially hydrogenated oil, vegetable oil, etc. The essential fatty acids or EFAs are what we need to strengthen cell walls, lubricate joints, prevent blood clotting, lower high blood pressure, and decrease the rate of heart diseases and strokes. Best examples of foods with omega 3 are avocados, nuts and seeds, fish oil, flax seed oil, etc. In totality, the book justifies the importance of alkalizing food, most importantly the benefits of green vegetables to regain the totality of wellness. Nevertheless, you may want to argue that why fruits should be avoided. To back it up, in some health conditions like Crohn’s disease and colitis, acid fruits should totally be avoided because it can upset the digestive tract. Yes, it is overlapping to some health claims that fruits are rich in countless vitamins and minerals. Maybe for the best, the keyword is balance. While we can dominate the plate from various leafy vegetables, eat small portion of fruits few hours before and after a meal. For all we know, giving up meat is not an easy feat, how much more giving up something we think could be best for our health. 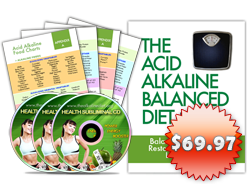 Moreover, the book profoundly lays out all the basic steps to maintain proper balance including many tips on the preparation of alkalizing food and menu. The success now of the program relies on individuals who have discipline to have personal responsibility for their sudden change of lifestyle. There are testimonials and success stories included that are truly inspiring. Nevertheless, the book has disclaimer informing the readers that the program is not intended to replace medication and it is still necessary to consult with the doctor regarding important matters to health condition that requires medical attention.